I got an air-fryer! But, what is it? It’s not a deep fryer like it sounds like it might be. An air-fryer is a mini convection oven that helps foods cook faster and crisper. This means that you can make all kinds of foods that you would normally make in the oven or use a lot of oil to get crisp. I’ve been telling everyone about how much I love my air-fryer. It’s been a topic of serious conversation with my gym buddies, neighbors, and anyone else who will listen. I get a lot of questions about what kinds of foods you can make in an air-fryer. My answer is that you can cook anything in an air-fryer that you would normally make in the oven, but the benefit is that the food will cook much faster and with less oil. I’ve had my air-fryer for a few months now. I’ve actually already upgraded it from a basic model to a nicer one that has a stainless steel basket instead of non-stick (this is the air-fryer I have now). I love it for so many reasons. There’s no pre-heating necessary with an air-fryer so it saves time. The food cooks faster so it’s more efficient. The air-fryer doesn’t heat up the kitchen the way an oven does. These are all the reasons why I decided to make muffins in the air-fryer instead of the oven. It only took me about 10 minutes to make the batter and 10 minutes to cook the muffins, which means I was eating a hot, fluffy, delicious blueberry muffin 20 minutes after I decided to make them. How cool is that?! 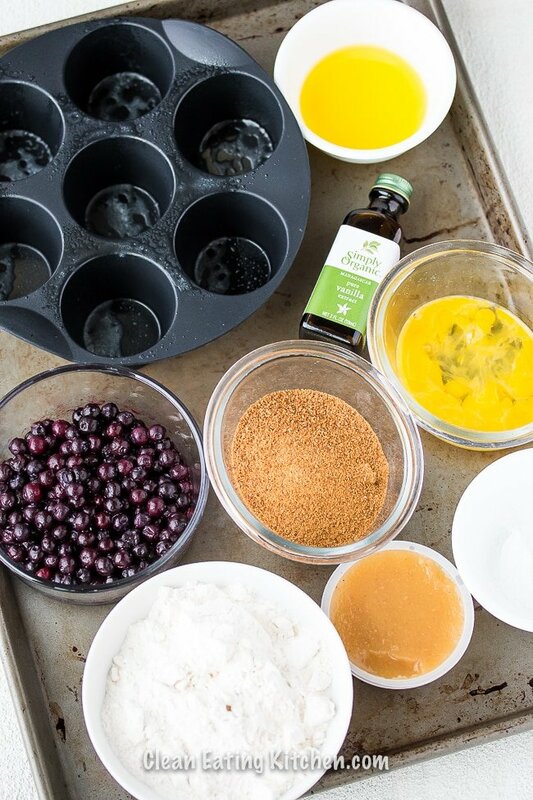 The ingredients for making air-fryer blueberry muffins are the same as you would use for regular baked muffins. You could cut my recipe in half if you want to make just one batch. I made two batches of muffins which amounted to 14 mini muffins total (I used the silicone mold from this air-fryer accessories set). I did have to buy a special pan that would fit in my air-fryer, but I’m hopeful that I’ll be using it a lot. I bought a silicone pan like this one. It should fit in most air-fryer models. 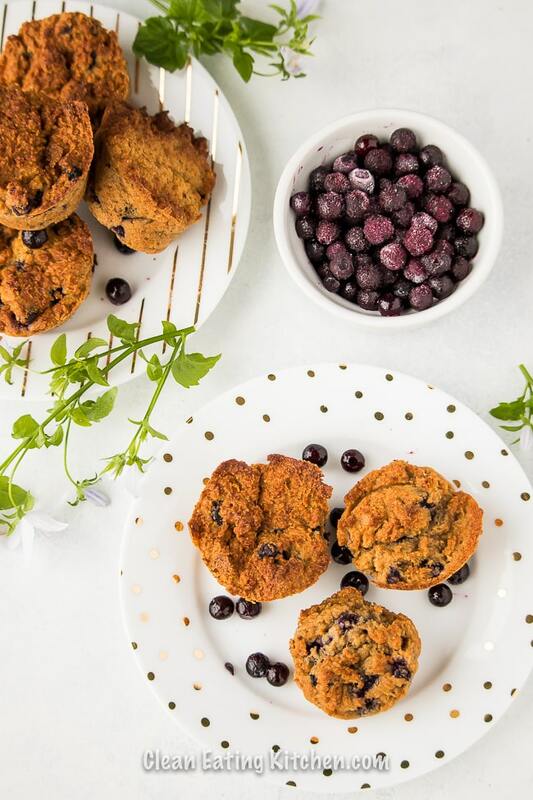 Making these muffins is a snap. I combined the dry ingredients including the frozen blueberries in a big bowl and gave them a stir. I combined the wet ingredients in a small bowl and poured them into the dry ingredients. I stirred the batter and used a tablespoon to divide half the mixture into my lightly-greased pan. The batter got baked at 350 degrees for 10 minutes. Then, I easily removed the baked muffins to a cooling rack and re-filled the muffin pan with the rest of the batter to bake the rest of them. 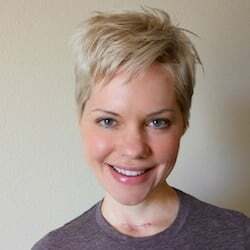 I couldn’t believe how fast the baking process happened in my air-fryer. 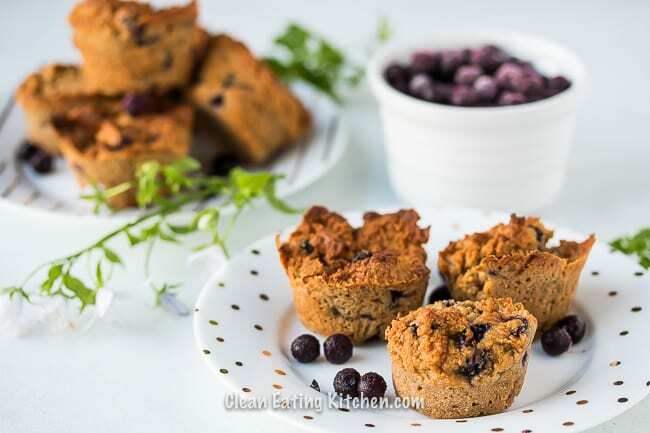 Can I use paper muffin tins for my muffins? You can use any tin or mold in your air-fryer that is oven-safe. Can I bake these in an oven? Yes! I would recommend 350 degrees for 15-20 minutes or until they are golden brown on top. Yes, just use coconut oil instead of ghee and a flax egg for the egg. Be sure to pin this image to save this air-fryer muffin recipe for later! Wow, these are amazing! Love the fact that they’re gluten free, too! 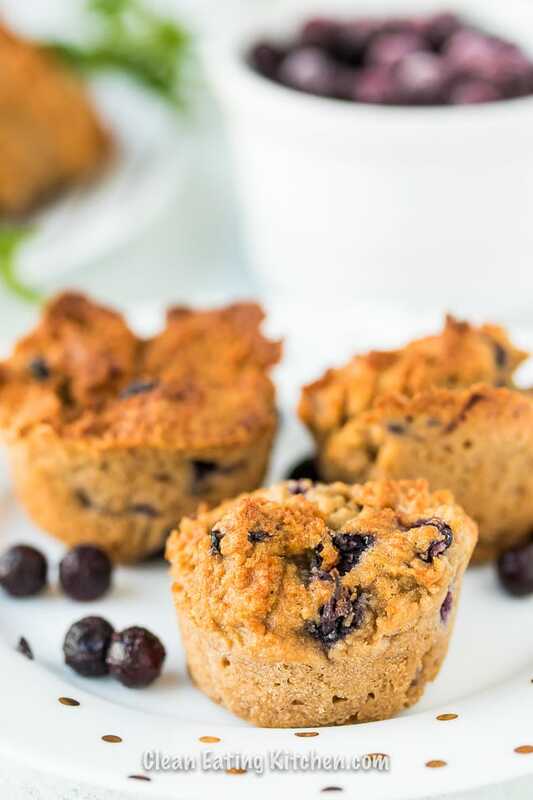 These blueberry muffins look perfect for breakfast with a cup of coffee. I really need to look into getting an air fryer. It sounds like a great piece of kitchen equipment. Thank you for including a note on how to make it in the oven too. These are perfect for the whole family to enjoy! 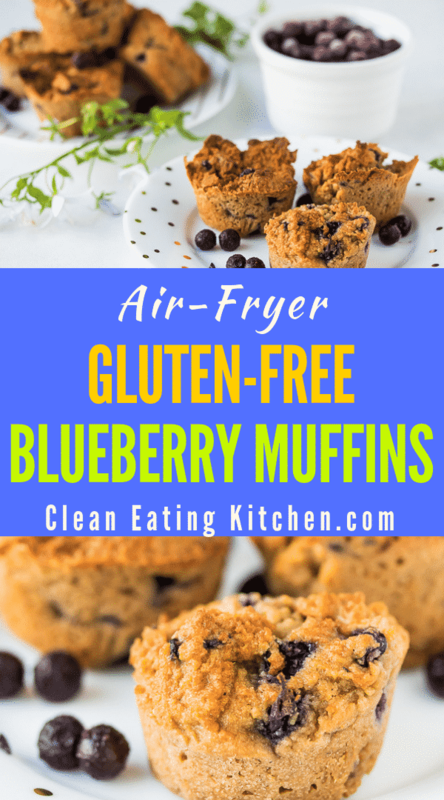 Oh my gosh, I had no idea you could make muffins in the air fryer!! 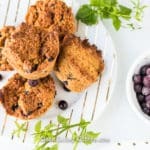 These look amazing and I’m a sucker for blueberry muffins, I just adore them. Definitely trying these!